Ok, I will go pin by pin on the 1227747 harness. I run 2 relays. 1 for 12v to the ignition, ECM power and injectors, and 1 for the fuel pump. I use the basic 30 amp aux lighting relays from the parts store. If the harness came with the factory fuel pump relay than I retain that relay. If not I use the 2nd 30 amp relay for the fuel pump. Both relays are energized from the 12v ignition wire that used to go to the + side of the coil. Since it is only used to turn the relays on there is less draw on the stock 30 year old Scout wiring. I don't run the ign from the switch. Due to voltage drop from the old IH wiring. I run all switched(from the key "on" position) 12vdc thru the relay. there are several different versions of the relay out there so look at the pin numbers before you buy one. there are 2- 87 output terminals on the spst 5 terminal relay so you can use both. To start with print the diagrams. You want to get sheet 2 and 3. At the bottom of sheet 2 is the fp relay circuit for the s/t m series of trucks. I will use it for the explaination. Here's the diagrams...they are also attached below. pin a comes from the ECM pin a1 and is used to apply 12v to the relay to turn it on. Pin c is the ground wire. Can be connected to one of the black/wht wires. Pin d is your 12v from a fuse. This is normally tied to the org wires b1 and c16. It is the same that provides the bat 12v to the ECM. 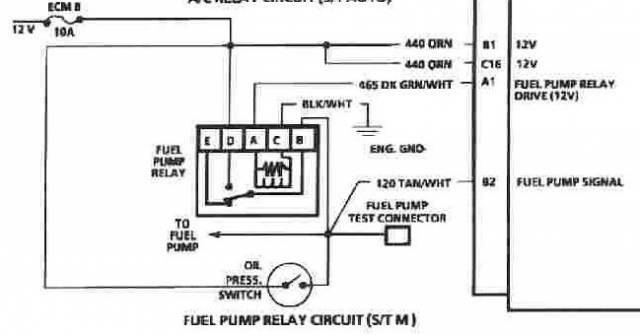 Pin b is the output of the relay going to the fuel pump or any other load you have connected to it. This also ties to pin b2 of the ECM to tell it when the fp is actually running. Now the pin letters May not be exactly the same as this diagram. That's not important. If you follow the diagram here and the description and just match it up to the diagram on your relay!!! There are 2 connectors. If you look really close you can see they are labeled. The small one is a & b. The large one is c & d.
There are also numbers on the plug for each pin. so to start out we will go right down the line in order. A1- grn/wht- this wire is used to energize the fuel pump relay. a4- gry- to egr relay. (optional) this is a ground from the ECM to control the egr relay. A5- brn/wht- ses(service eng soon) light. This is a ground to turn on the light. A6- pnk/blk- switched 12v from the ignition relay. a8- orn- aldl serial data. This is your aldl pin e data for your lap top. A9- wht/blk- aldl pin b diag mode. When jumpered to ground will set the ECM to aldl diagnostic mode. a11- ppl or blk- map sensor ground. A12- blk/wht- system ground. Can be tied with d1. Goes to engine ground. Just to clear the confusion on which pins are grounds I have taken a c3 ECM apart and labeled the pin locations on the plugs. If you look you can see that d1 and d2 are solder connected and a11 and a12 are also connected. So if either one of the two, example: d1 and a11 are grounded the other one will be. D2 and a12. b1- orn- 12v fused from battery. I use an inline fuse on this. It also ties into c16. B2- tan/wht- fuel pump signal from the relay. This one ties into several places, the fuel pump, the relay, and the ECM. When the relay is on it sends 12v thru this wire to turn on the fuel pump, at the same time it tells the ECM the fuel pump is on. b7- blk- esc signal this is the knock sensor signal to the ECM. The knock sensor circuit is optional. If not used, tie this wire to c14 the 5v reference. This will fool the system sometimes but you will need to program the chip to prevent the ses light from coming on. B8- dk grn- ac signal. This tells the ECM that the ac is turned on. This can be used to set the idle speed higher when you turn the ac on. I use it to increase the idle when using the compressor for on board air. Same thing!! Just tie it to the wire going to the ac clutch. c6- iac -the ECM controls the iac motor. It adjust the amount of air that is bypassed around the butterflies to adjust the idle speed. c9- ppl/wht- starter crank signal. Goes to the small terminal of the starter. The stock Scout wire is white that goes there. Tells the ECM you are trying to start the engine. c14- gry- 5v reference signal to map and tps. C15- grn- inj b ground signal. Most systems do not use this. It was used on some of the bigger engines to share the load of the injector signal. d1- blk/wht- system ground, ties to a12 and engine. D2- blk- sensor ground. To eng block or head. d5- tan/blk- est bypass. This is the wire that has a plug near the distr that you disconnect to set your timing. D6- tan- o2 ground to engine. If you sit down on your garage floor and have each sensor plugged into the harness, then trace each wire back to the ECM connector, you will be able to separate a lot of uneeded wires. Once you have each wire identified and layed out, then you can set it up on the engine and start tailoring it to fit your engine. Placement of the sensors will determine wire length. Most stock harnesses are plenty long and only need to be shortened or wrapped and bundled. When I'm all done and it's running then I go back and reinstall the plastic loom over all the harness. always perform the voltage checks listed on sheet 1 of the diagrams before the first engine start. Last edited by Bill USN-1; 05-19-2010 at 09:04 AM..